As we approach one of the most vibrant and commercialised holidays of the year, are you stuck in present limo? Valentine’s Day can actually become extremely frustrating for some. Money can be tight at the start of the year, you’ve used up all of your mojo finding the world’s best Christmas present, and you are running out of ideas. This is the plight of many people – both male and female. However, rather than succumbing to the clichés and pick up the usual order, why not go for something far more unique and thoughtful? We have a full range of outstanding Valentine’s Day gifts. As well as this, our usual product range carries the same level of significant and quality – after all, beautiful gifts are beautiful gifts! We have a wide variety of unique handmade presents which are perfect for Him or Her. It does not matter who you are buying for, we will have a crafted item which will act as the perfect solution to your mental block in finding a present! We carry various Valentines presents, even especially for cat lovers. Our product range around this time of year has many feline objects and crafts that would make the perfect gift for anybody with a love or respect of cats. As well as this, we carry many outstanding wood carvings which are from Indonesia. The world has so many different cultures and styles in our work that it would be criminal not to look elsewhere, right? This is why we try to give such a huge list of different objects from all across the globe. Whether you wanted to capture a specific theme or style with our handmade Canary Islands jewellery, or think one of our many Russian tapestries would be something your other would like, we have something for everybody. You no longer need to stand in long queues with the same presents as everybody else under your arm! With our help, you can find genuinely inspirational and unique products and gifts for your loved one. Nothing says you love them like the time spent finding a truly unique gift, and this is just right for anybody searching for that! So take the stress out of your Valentine’s Day gift hunt and make the right choice to come and see our fine selection available here. We make sure that we offer the best quality, nothing else. When we think of giving someone a gift, we want to give something heartfelt. The best gifts are handmade gifts. They are unique, they are personal. We offer exquisite one-of-a-kind items that will please anyone on your gift-giving list. We can also offer alluring and eclectic earrings. This jewellery would be cherished by any woman! Please have a look at gorgeous gemstone, crystal and wooden necklaces and bracelets. If you want to give a whimsical gift, try a wooden handcarved item from Bali. 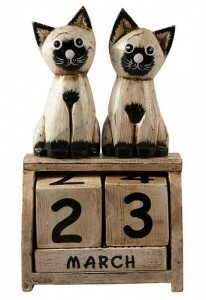 There are calendars held by adorable wooden animals, pet food dish holders, bird feeders and soulful statutes. Though not large items, they will be conversation pieces in any home. A divine handmade gift is an embroideried picture. These cross-stitched gems are of comical critters and will brighten up any space in a home. A great handmade gift idea is a woven bag. These are beautiful and unmatched woven bags in various styles and sizes and adorned with shells, embroidery, or sequins among other items. They come in a variety of colors and uses, from dress-up, to everyday use, to a trip to the beach. Great handmade gift ideas for that special man include a wooden business card holder. Not only is it hand-made, it is made in the shape of a hand! Any man would enjoy a wooden bottle holder in the shape of a dolphin. These are also handcarved from Bali and beautiful pieces. These miniature trees handmade of gems are thought to have healing properties or life-enhancing properties. Made from birch, these napkin holders, candle holders and trivets bring the passion of the outdoors into the home. Commemorate a recent trip to the beach with a beautiful shoreline painting. It’s sure to bring a smile to anyone’s face. These are just ten of the many handmade gift ideas. Take a look! It’s certain you will have a hard time picking just one item.